Are you looking for a strong, durable, and stylish flooring material to use in your new home or remodeling project? Consider visiting our store to take a look at our wide selection of ceramic tile flooring from popular and trusted manufacturers. Whether you’re adding a tile flooring to your bathroom or redoing your entire home in the material, we have a full selection of colors, styles, textures, and sizes to suit all your home decorating needs. Once you’ve chosen the perfect ceramic tile for your home, allow our skilled professionals to provide ceramic tile flooring installation to protect your investment. We have extensive experience in all types of flooring including hardwood, vinyl, carpet, and more. Our flooring experts are always available to help you choose something that suits your needs and budget exactly. While ceramic used to be viewed as a material strictly for kitchen or bathroom use only, it has recently become popular to use throughout the home due to its wide range of style and color options. A ceramic tile floor is able to mimic virtually any other material, making it an affordable and long-lasting alternative for people who love the look of natural stone or hardwood, but not the maintenance or price. Whether you prefer the appearance of hardwood, granite, slate, or marble, there’s a style of ceramic tile that suits your preference. If you’re unsure which type or style of ceramic flooring to choose for your home, our experts are always happy to help you explore your options from popular brands including Floorcraft and Star Values. Protect your new investment by scheduling ceramic tile flooring installation with our skilled and experienced installation specialists. It’s important to allow our team to install your new purchase in order to get the longest and safest use from your flooring. While many people may be tempted to try to save money by hiring an amateur, this usually ends up in expensive repairs or replacement tiles in the future. By allowing one of our ceramic flooring specialists to install your floor tiles, you know your floors will be installed using approved methods and materials without cutting any corners. 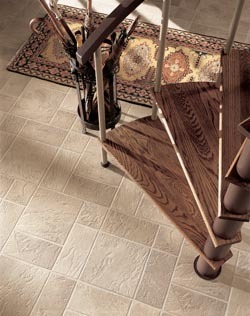 Your ceramic tile floors are sure to last for many long years when you count on us to install them. Ceramic tile flooring is the perfect material for any room in the house, including living rooms, bedrooms, and hallways. Because it is water and stain-resistant, it is perfect for the kitchen, bathroom, and laundry rooms. Many people also choose to use ceramic tiles in outdoor areas like the patio or poolside because it is resistant to extreme heat and cold, so it’s able to stand up to a wide range of climate conditions. In addition to its resilience and durability, ceramic tile floors are great for homes with residents who suffer from allergies or asthma. Because they have no fibers to trap dust in, ceramic tiles don’t hold onto dust, pet dander, or pollen. Your regular floor maintenance routine is enough to clean up these allergy irritants and protect your family from respiratory issues. Contact us to schedule ceramic tile flooring installation with our skilled professionals. We are conveniently located to serve customers in and around Flint, Swartz Creek, Grand Blanc, Davison, and Flushing, Michigan.